INJURY UPDATE: Striker Cleared For Newcastle Game. HomeNewsINJURY UPDATE: Striker Cleared For Newcastle Game. 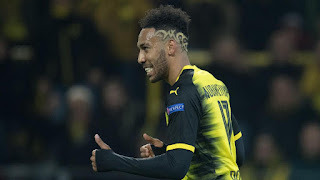 Pierre-Emerick Aubameyang left the Gabonese camp to make an early return to Arsenal fueling speculations that he suffered an injury on international duty. Some of you almost released pee in your pants when the news surfaced. Don't be shy. You were one of them. Right? I understand your plight. Well, the goal machine is as fit as could be and is gallant to feature even if called upon to participate in a game this minute. He was one of the three players allowed to leave ahead of Gabon's final friendly game of the international break and in as much as one of them was injured, not all were. “Gabon coach Antonio Camacho will also have to work without some key players including Pierre Emerick Aubameyang and Mario Lemina. They have been made available to their respective clubs, and Serge Martinsson Ngouali was injured in the knee at training,” Fegafoot, the Gabonese Football Federation, said in a statement. Lucas Torreira has also been passed fit and should be in contention to make the squad by the time Arsenal make a trip to Newcastle for their fifth Premier League game of the season this weekend. The midfielder who joined from Sampdoria in the summer transfer window suffered an injury in Uruguay's 4-1 win over Mexico. Initially, reports ruled him out of at least one game, giving the first Europa League group stage game as a possible return date but the 22-year-old has since returned to training after the scare. He will be hoping to start as we are also hoping he does in the game against the Magpies. He is yet to show up in the Arsenal starting lineup so far in the present campaign.